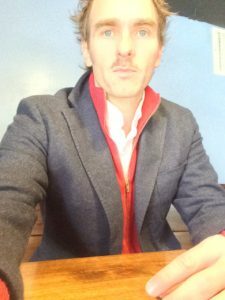 Brian Blanchfield is the author of three books of poetry and prose, most recently Proxies, published by Nightboat Books in 2016, and by Picador UK in 2017. A collection of essays—part cultural close reading, part dicey autobiography—Proxies was awarded a 2016 Whiting Award in Nonfiction, was named a finalist for the Lambda Literary Award in Gay Memoir and the PEN USA Literary Award in Nonfiction, and has been widely reviewed. His first two books are collections of poetry: Not Even Then (University of California Press, 2004) and A Several World, (Nightboat Books, 2014), which received the 2014 James Laughlin Award from the Academy of American Poets and was longlisted for the 2014 National Book Award for Poetry. His poetry and prose have appeared in Harper’s, The Nation, Chicago Review, BOMB, The Brooklyn Rail, Lana Turner, The Paris Review, Brick, Conjunctions, Guernica, StoryQuarterly, and The Oxford American, among other journals and magazines. Two long sequences—one poetry, one prose—are available as chapbooks: The History of Ideas, 1973-2012 (Spork Press, 2013) and Correction. (Essay Press, 2016). He is the recipient of a 2015-16 Howard Foundation Fellowship. Born in 1973 in Winston-Salem, and raised in the central Piedmont of North Carolina and Virginia, he has lived in New York City, Los Angeles, Missoula, Boston, Tucson, and Iowa City, where he has taught creative writing at The Pratt Institute, Otis College of Art and Design, Cal Arts, University of Montana, University of Arizona, and The Iowa Writers’ Workshop. Before and between teaching gigs he worked in arts admin, radio, and publishing, including editorial stints at Farrar, Straus & Giroux and Fence Magazine. From 2015 to 2017, in partnership with the University of Arizona Poetry Center, he was creator and host of the biweekly poetry-and-music program Speedway and Swan on KXCI Community Radio. He teaches creative writing and literature at The University of Idaho and in the Bennington Writing Seminars. He and his partner, the poet John Myers, make their home in Moscow, Idaho. What more to say? What else is there to know?